How do you get someone to like you immediately? That was the question I asked eminent psychologist Robert Cialdini in a blog interview. The secret? He says it’s to find a commonality — any commonality — fast. It could be something as simple as the fact that you live in the same neighborhood, or you both like running. One particularly powerful bond is having an alumni connection, because your shared history or point of view allows you to build trust (and a solid relationship) quickly. 1. Choose a Cause You Care About: If you hated your college experience or are only joining a group because your boss is a member, your lack of interest will eventually show through. It takes energy to participate, and sometimes you’re called upon to do unpleasant things (get up at six A.M. for a charity run or stay to clean up after an evening meeting). If you care about the cause, that sense of mission can get you through; if you’re neutral or tepid, it’s hard to justify the investment. You’ll be asking: is this how I really want to spend my free time? 2. Select Projects You Like: The alumni association could probably use plenty of volunteers to chair fund-raising dinners or monitor the finances of local chapters, but that wasn’t what interested Baxter. Because she’s volunteering, she can choose the scope of her engagement and concentrate on the tasks that are enjoyable, like connecting with friends from her class (through organizing reunions and the class notes column), networking with fellow alums (through running a speaker series and holding one-on-one coffees), and sharing her professional expertise (through volunteering to give lectures and webinars). 3. Go Deep With One Cause: If Baxter had dispersed her volunteer efforts, she probably would have met more people at first, going to different events and mingling with diverse crowds. But by investing in Stanford, she came to be recognized as a leader and was tapped for high-visibility roles that ensured she wasn’t just meeting people one-on-one; people she’d never talked to now know exactly who she is. She was recently tapped to serve on a prestigious advisory committee for the school, the Women’s Initiative Network. “It was a really great opportunity, and I don’t think I would have been invited if I hadn’t done so much work with Stanford already,” she says. Through her work on that committee, including helping to organize an annual conference, she’s built relationships with influential alumni. Shared alumni ties are a powerful bond. If you genuinely valued the experience, as Baxter did, it may be worthwhile to get more involved and maximize the value of your affiliation. Your shared history will allow you to build trust faster, and that may well turn into job offers or business deals that wouldn’t have otherwise been possible. Dorie Clark is a marketing strategist and professional speaker who teaches at Duke University’s Fuqua School of Business. She is the author of "Reinventing You" and "Stand Out". 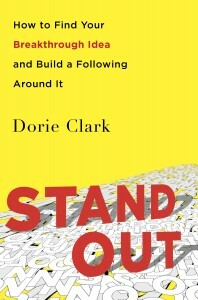 You can receive her free "Stand Out Self-Assessment Workbook" from her website and follow her on Twitter (@dorieclark).